Kim Kardashnguyen: I'll Be Your American Boy! 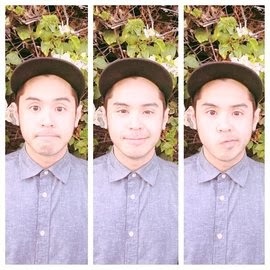 I'll Be Your American Boy! My best friend Jon from The Stuff I'm Into Blog left our homes in San Francisco and made way across the Bay Bridge into Oakland... To see Estelle who made way across the pond into The New Parish to perform in her All Of Me Tour. I've never been to The New Parish, it's a smaller more intimate venue, which I love for concerts. Jon and I amongst the crowd waiting to see Elle Varner. Sweaty from dancing. And we may or may not be a little inebriated in this picture. People always mention how much we look alike, I didn't realize it till now. And yes, I do need those glasses to see. Elle Varner was amazzzing (yes with 3 z's, she was that great). I'm really liking her music, and her 2 singles she has released: Only Wanna Give It To You and Refill. She sings, writes, and plays guitar. Her sound is just... fresh. I'm in love with it. Social media story time: Jon was tweeting Elle before her performance, and she was tweeting him back! So before she came on, we told her to "look for the Asian boys wearing glasses." As soon as she gets on stage, she asks "Where are my Asian boys wearing the glasses?"... Of course Jon and I go bananas. Totally made our night. We continued talking to her via twitter trying to meet her, and we were sooooo close! 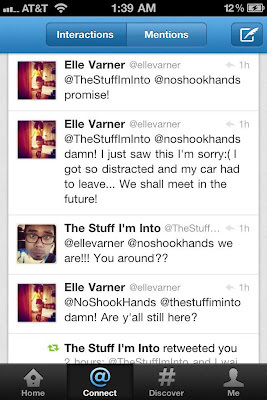 But Miss Elle Varner ended up having to leave, promising Jon and I she'll meet us next time... We're holding you to that promise, Elle! I have proof of it on my twitter. Estelle is such a great and fun performer. I loved her stage presence. She interacts with the crowd through out her entire performance, which was awesome. And she's gorgeous! Fun, right? Funny how she wants an American boy, because I'd totally want a British bloke. Labels: blog, concerts, music, Oakland, what happend last night? And nice with the "British Bloke," that's def on my list of boys to do. Brothers from another mother. But, I must say, we are looking totes adorbz.